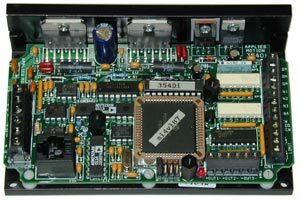 The 3540i step motor drive is a programmable, microstepping, bipolar stepper drive suitable for a wide range of motion control applications. It includes an intuitive, user-friendly programming language for creating powerful indexing programs that are stored in the drive and allow the drive and motor to run stand-alone. 8 digital inputs and 3 digital outputs faciliate interfacing to other devices, such as PLCs, sensors, switches, etc. The 3540i includes Applied Motion’s easy-to-use Si Programmer™ software for the rapid development of stand-alone motion control programs. The 3540i can also be controlled via streaming serial commands using Applied Motion’s Serial Command Language (SCL).